Amazon India brings you Coolpad Note 3 lite one of the best mid range and best featured Mobiles in 2016. If you are a person looking for a mobile with low price and amazing features Coolpad Note 3 Lite is best choice. Coolpad Note 3 lite will be available in Amazon India Sale from 10th March, 2PM, bookings for this mobile are open now. The price of this mobile is just Rs.6,999 only. Display : 5-inch IPS HD display with 1280 X 720 with scratch resist glass and Capacitive 5-point multi-touch. Connectivity : Dual-SIM Standby (4G+4G), GPRS, WIFI 802, WIFI hotspot, Bluetooth 4.0, F.M Radio. Operating System : Android 5.1 + CoolUI 6.0. Processor : 1.3GHz 64bit Quad Core processor for all your Multitasking. Memory : 3GB RAM which is used to store all your Applications Data. Storage : 16GB internal memory and expandable up to 32GB. Sensors : Proximity, Light, Gravity, Magnetic, Accelerometer. Security : Fingerprint FPC 1021 scanner. Battery : 2500mAh Battery for 200 hours standby time. Camera : 13MP Primary Rear Camera, 5MP Front Camera for Best Selfies. 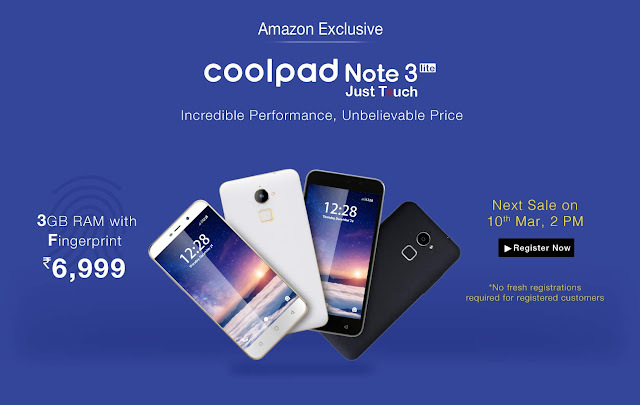 To Buy this Coolpad Note 3 lite - Click Here. Also buy Bose Speakers and Headphones with 30% off here.